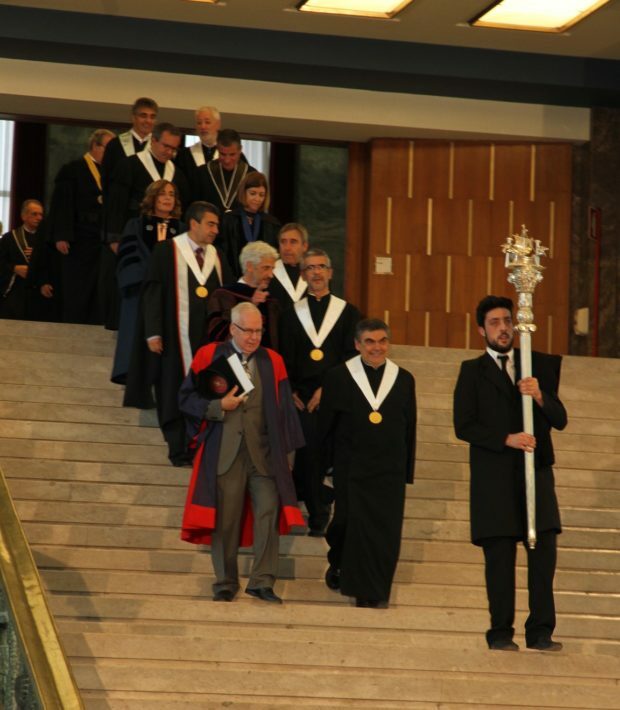 The solemn session of the Opening of the Academic Year 2016-2017 took place on 13 October in the Aula Magna of the Rector’s Building of the University of Lisbon. The ceremony began with the Academic Procession, accompanied by the Choir of the University of Lisbon. 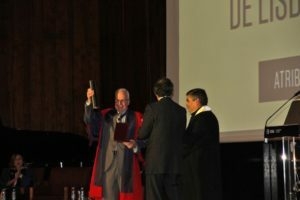 This was followed by the award of the University of Lisbon Prize to architect Nuno Teotónio Pereira, Doctor Honoris Causa from the University of Lisbon and winner of the University of Lisbon Prize 2015. Then there was the tribute paid to all those who retired from the University, which was followed by the speeches by Luis Pereira (MA), representing the administrative and technical staff, student Eunice Afonso, representing the students, Professor Cristina Bastos, representing the lecturers and researchers, and the Rector, Professor António Cruz Serra. 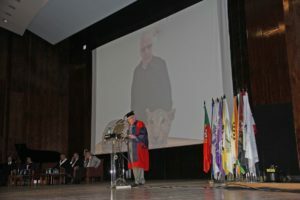 In his speech, the Rector said that the ceremony was a moment of reaffirmation of the fundamental principles of citizenship and preservation of the University as a key institution for the valorisation and praise of individuals, which is done through education, knowledge, and the perennial values of humanity. Universities are key partners in a global system increasingly dominated by knowledge. Knowledge is the main engine of economic growth, and education is the sole basis able to promote individual prosperity and the social mobility of populations. He also mentioned the importance of the start of the Doctoral Scholarships programme, which aims to increase the research conducted at the University. There will be approximately 150 research grants financed with the institution’s own resources, to mitigate the effect of the reduction in funding of scholarship programmes by the Foundation for Science and Technology. The celebratory concert was held on 14 October in the Aula Magna, with the performance of Orquestra do Norte, directed by José Ferreira Lobo and the participation of the following choirs: University of Lisbon Choir with soloists Sandra Medeiros, Joana Nascimento, Manuel Gamito, and André Baleiro; Coral Association of the University of Lisbon; Eborae Musica; Sacred Choir of ESML, and the Tagus Choir.